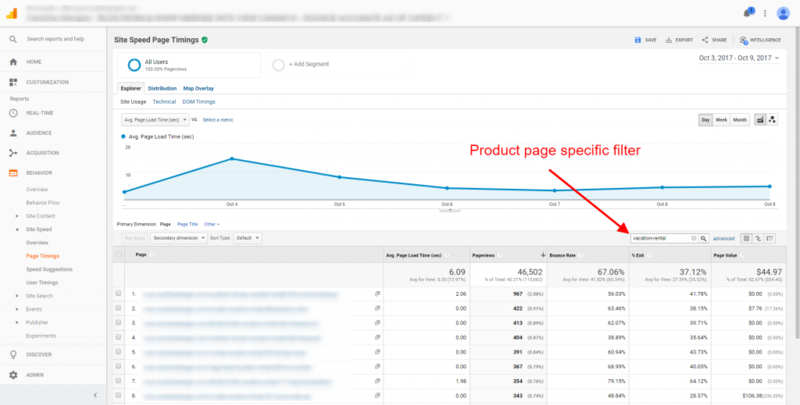 Page Value is a metric within Google Analytics that isn’t used very often by marketing teams. It can be powerful when you begin to analyze your site content for what is working and what isn’t. Page Value is derived from Google Analytics’ Goal Values and Ecommerce reports. 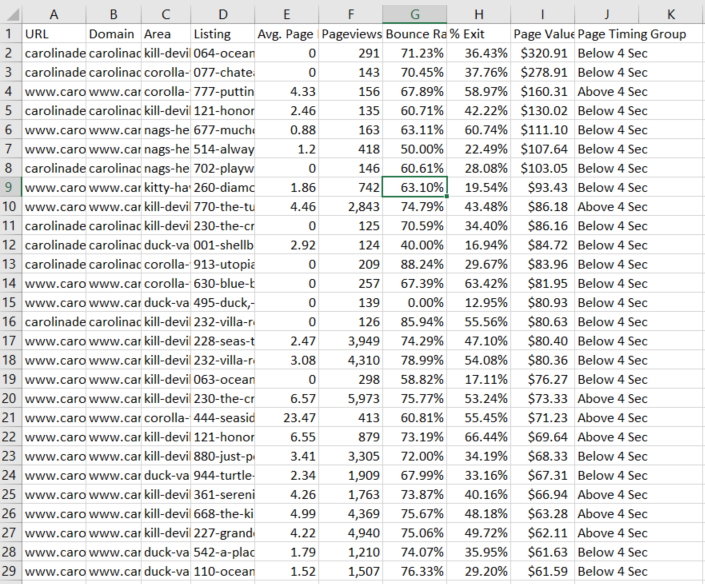 It tells you which specific pages of your site offer the most value. For instance, a product page for an Ecommerce site will usually have a higher page value than a resource page. The same goes for a landing page for a lead generation site when compared to the homepage of the same site. Landing pages usually drive more page value when we look at a Goal setup for capturing lead completions than a high level homepage. You can understand more about Goal Value by reading our Google Analytics Goal Setup post. One of the best ways you can use Page Value is to analyze it against the Average Page Load Time metric. Change the settings to “Data” view rather than “Comparison” view. Next, export the data to Excel or Google Sheets. 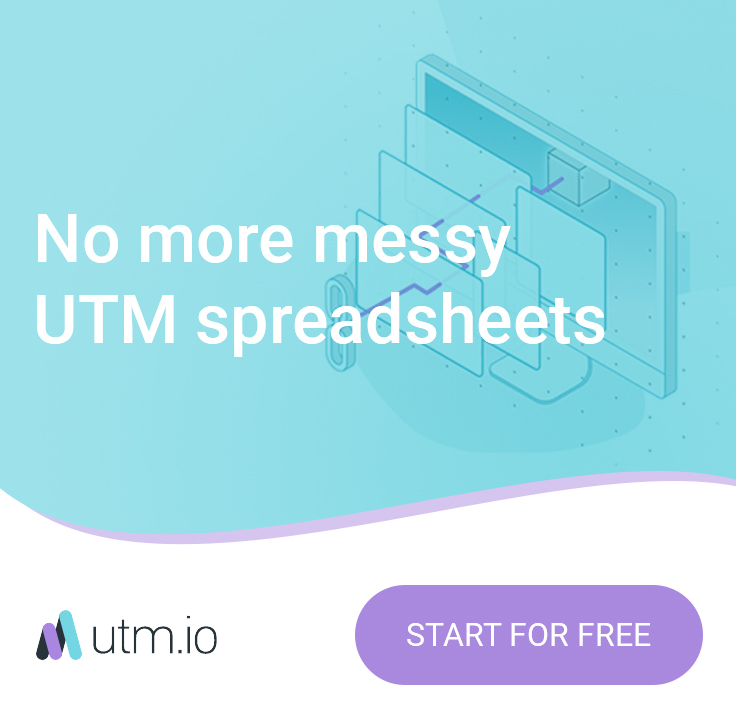 Now, with Column J added (differentiating the page load times), we can build a pivot table to see the difference in Page Value (Column I in Excel).We lose about $5 for every user that views a page that loads slower than average. Multiply that by the number of page views these pages get and you have a big impact in overall potential revenue. You’ll find that instituting these techniques will help improve page loading time across your website. If you’re serious about increasing your Ecommerce sales, you should have a developer tackle these as soon as possible. This is just one quick tip in understanding how Page Value can show you where to optimize your site and how Average Page Load Time could be affecting your return on investment. Be sure you use this Page Value and Average Page Load Time analysis to prioritize which pages need the most attention first. We’ll be coming up with more of these quick tip posts in the future. For all your analytics and CRO needs, please give us a call (321-202-1319) or send a message for us to help you get the most value out of your site. You are spot on that Page Value is very valuable but is not often used by marketing teams. Once you have Page Value setup it can be used to determine all kinds of attributes that best contribute to business value, like you did with page time. I think the challenge for most marketing teams is how to custom setup the goals and goal values on their site. For WordPress there is a plugin that helps automate this the goal setup and valuing process: https://wordpress.org/plugins/intelligence. That’s pretty awesome, I’m going to have to check that out. Thank you for the note! 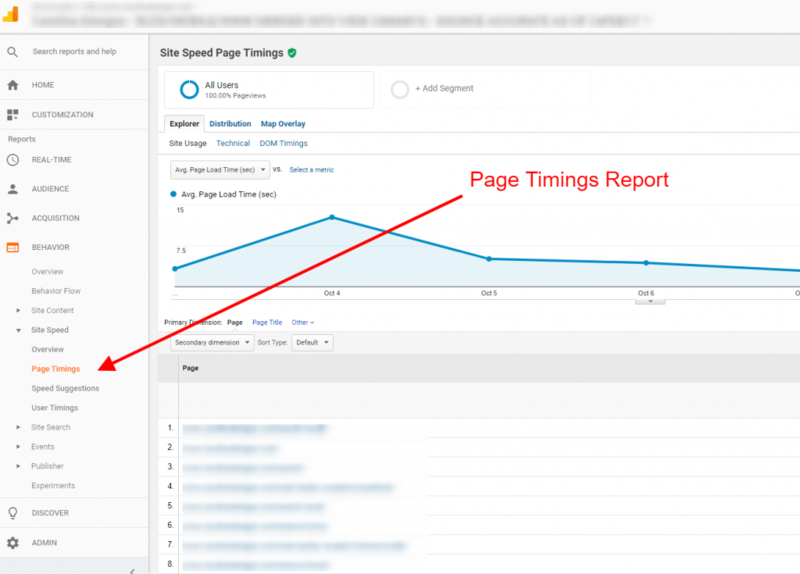 Utilizing page timing and page value as corresponding metrics to each other just add another way of viewing how much page time is attributing to the value you are gaining from your site. There are definitely other ways of looking at the pages in a path through funnel conversions, but for those who wonder about the value of increasing page load performance for their site, this offers a good ROI buffer. shortness of breath,wheezing and chest tightness. combination of several substances. The characteristic of restlessness is a that many asthma sufferers can relate to. They need being ready with new solutions to keep the clientele interested. operation is decided then your next may be the need to combine other photo editing service.